I woke up and saw something I didn’t like. Piles of clothing lined one wall of my bedroom. Two bins stacked on top of one another sat right next to my door. Over a month ago, I took on the monumental task of switching my children’s clothing from winter to summer. It is one of my least favorite tasks, because it never feels complete. There is always the stray pair of pajamas that show up two weeks later in the laundry. Or there is the realization that one child doesn’t have nearly enough clothing, because he’s not the size I thought he’d be. And then there’s the completion step: putting it all away, whether into closets, drawers, or back into storage. But this year, I took a little too long to finish the job. And I was annoyed with myself. 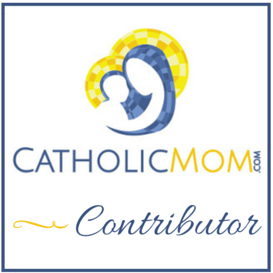 Last week at CatholicMom.com, I shared my struggle with motivation, especially when it comes to my house. I intended to work through the 31-day decluttering challenge at Living Well, Spending Less. But I quickly realized that one project per day is too much pressure; I need to declutter in my own timeframe. 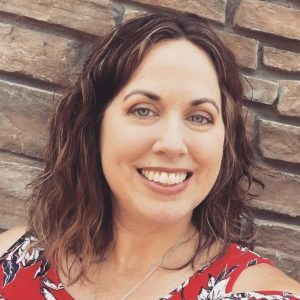 At the same time, I read a post on my friend Margaret’s blog and then another post on Modern Mrs. Darcy that raved about The Life-Changing Magic of Tidying Up by Marie Kondo. 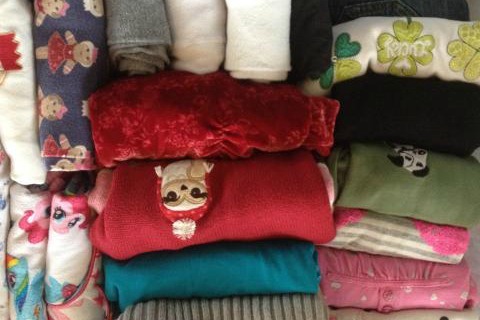 When I posted it on Facebook, my friend Mary shared that her folding method is addictive. What?! How could that be? All of this sounded really good to me. Even her method of organizing by category vs. room intrigued me enough to try. But the point Kondo makes that really gave me hope is when she talks about what happens after the tidying up is all said and done. We are holistic beings. When one aspect of life is out of sorts, other aspects are affected. My physical health affects my thoughts and prayer. Is it also affecting my environment? I admit, for awhile now, I have put the care of my mind, spirit and home on hold, because I haven’t been feeling well. But what if rather than waiting until I feel physically better, I take care of those things first? I’m already working on my mind and spirit, and now maybe it’s time to start working on my home, too. Since I tend to be an “all or nothing” person, which usually keeps me at nothing, I determined four projects that would not only change my extremist perspective, but also would move me a step closer toward an actual goal of improving my environment. The first was finally putting those bins away. After reading only a few chapters of The Life-Changing Magic of Tidying Up, however, I knew I could not just close up the bins and put them away. That would be quick and easy, but I would still have a mess on my hands this fall when I open those bins again. No, like I tell my children, I had to “do it right the first time.” And that would take time, like most of a day. 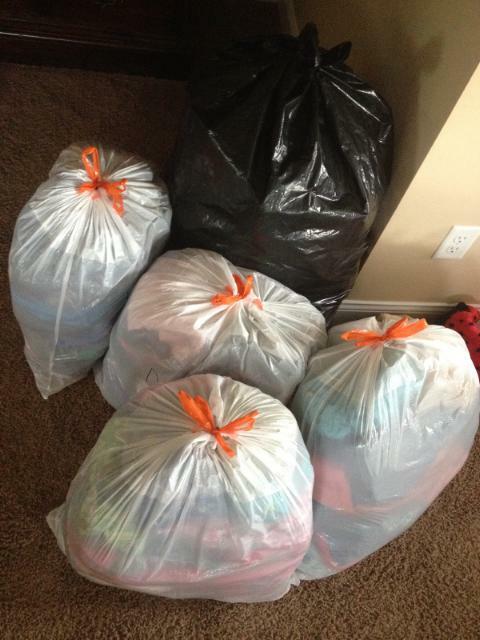 As I stared at the project ahead of me, I started with the pile of clothes that lined my wall. It was already designated to give away to young cousins or a thrift store, so into bags it went. Then, I moved to the bins. Since I only have two boys, I tackled their clothes first. I determined that I needed three bins to separate the sizes we currently are in or will be in soon: 5T-5/6, 7/8, and 8+. I sorted each size by sub-category, such as shirts and pants. I realized I had more than my boys actually need, especially because they tend to wear their favorite four shirts over and over again. So, I paired each sub-category down. For example, I had 10 shirts in one size, which I paired down to seven. When I got to the girls’ clothing, it was a bit more cumbersome. Four girls generate a lot of clothes! Two of them wear the exact same size, so I always have an abundance of one size when it gets passed down to the youngest. For example, while I need double the amount of size 9 clothing when Olivia and Lucia are in that size, I can get rid of half and still have plenty for Veronica when she grows into it. For each clothing size, I remained in the “getting rid of” phase until I had the right amount of clothing. 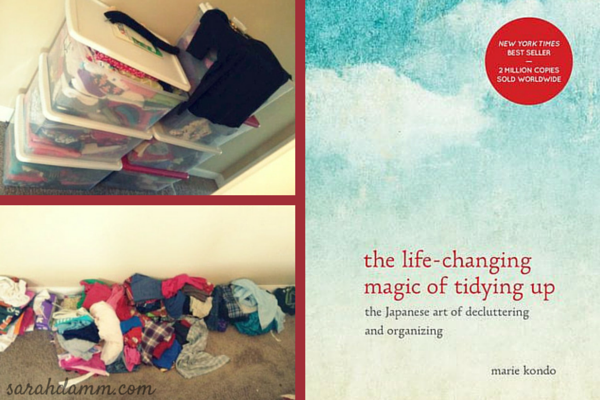 Then, I folded it all, using the KonMari Method, which is addictive by the way, and put it into my bins. Many of the bins had room in them for more, but we didn’t need more. 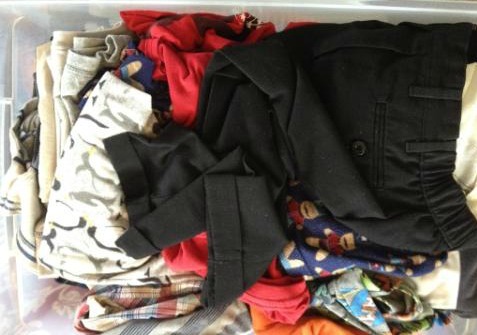 An example of what a typical bin of clothing looked like. What a mess! 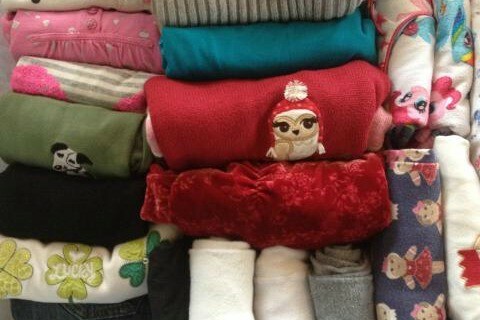 An example of what the inside of a bin looks like after my tidying and folding via the KonMari Method. What a difference! I finished the project by making labels for the bins—something I have not done in years. And with the help of my kids, we got them all back into the basement. I ended up with eight clothing bins, which seems like a lot, but I do have six children. I only kept the sizes they are in now or will be in soon. I don’t keep any clothing that is smaller than my youngest child. 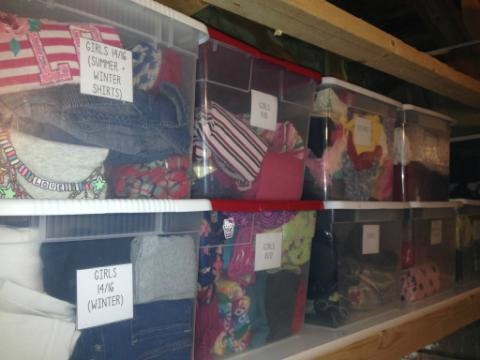 I also made a shoe bin, and I consolidated four costume bins into one. Oh! And I ended up with five bags to donate and two bags to throw away. After the day was over, I was sweaty and exhausted. But my sense of accomplishment was soaring through the roof! And I have Marie Kondo’s method and the encouragement of friends to thank for that! Yay for you! I have one place where clothes to be donated go and that’s it. My kids are too big to hand down (actually occasionally they hand down shirts to their dad — they are all bigger or as big as him!). Keeping the clothes moving through the laundry is my biggest battle. The newly weds are living with us until September and that is a lot of adult clothing, bedding and towels. Some days I do nothing but laundry. Yuck! Thanks, Barbara! My clothing storage is a lot smaller, as my children get older, so I really can imagine where you are with no storage at all! I used to keep the baby and toddler clothes “just in case,” but then I realized that some little souls could use it right now. So, I gave it away. If we ever need baby clothes again, I trust that God will provide. Laundry is its own thing … I can definitely relate. I can get behind so quickly. In fact, I’m usually behind! Ugh! I ordered the book last week when we texted about it! Can’t wait!!!!! Yay! I look forward to chatting with you about it soon! As far as laundry goes, I have a deal with my husband. I spend a lot of time working on Give Him 5, my prayer ministry or volunteer things. He says that as long as he has clean underwear, we are good. to check out your book recommendation. Thanks my friend! Thanks for stopping by, Michelle! You are not the only one with papers on her counter. I have them, too! 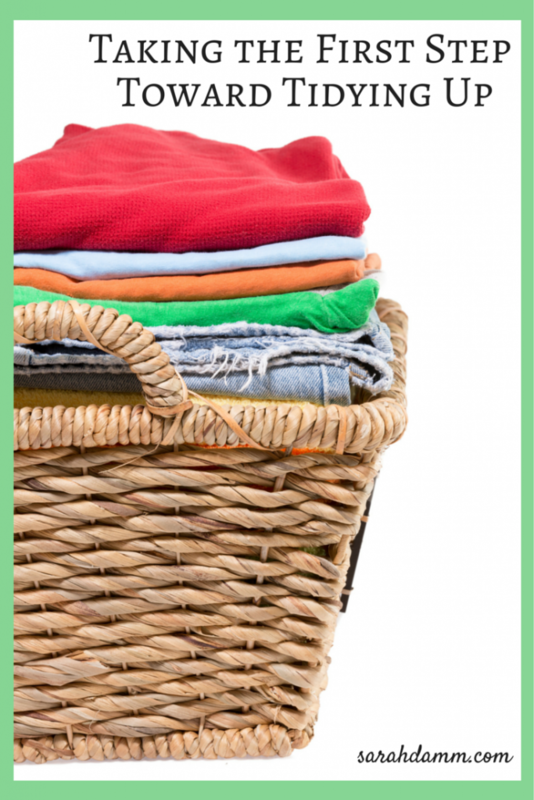 Piles are definitely a struggle for me … As for laundry, thankfully, my husband is pretty laid-back, too. It just gets overwhelming when I let it pile up too much. If you check out the book, you’ll have to let me know what you think!